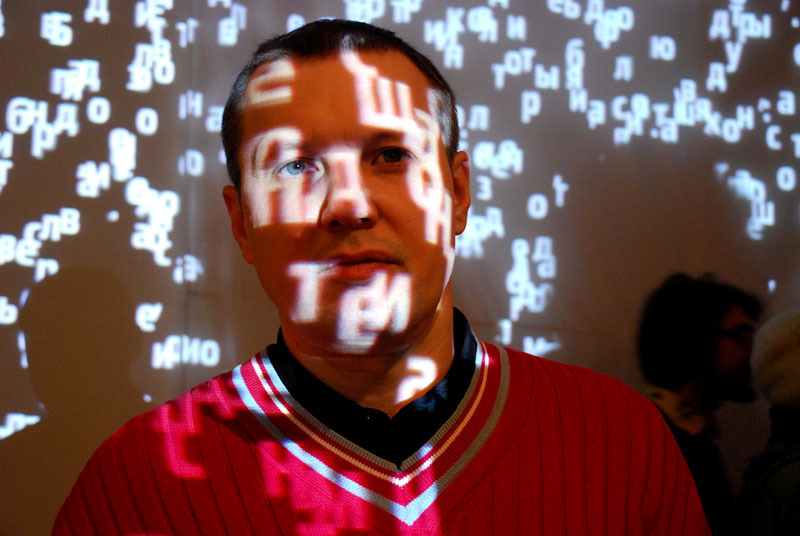 The third international festival of cybernetic art CYBERFEST 2009 took place November 20-29, 2009 in St. Petersburg at several art spaces. 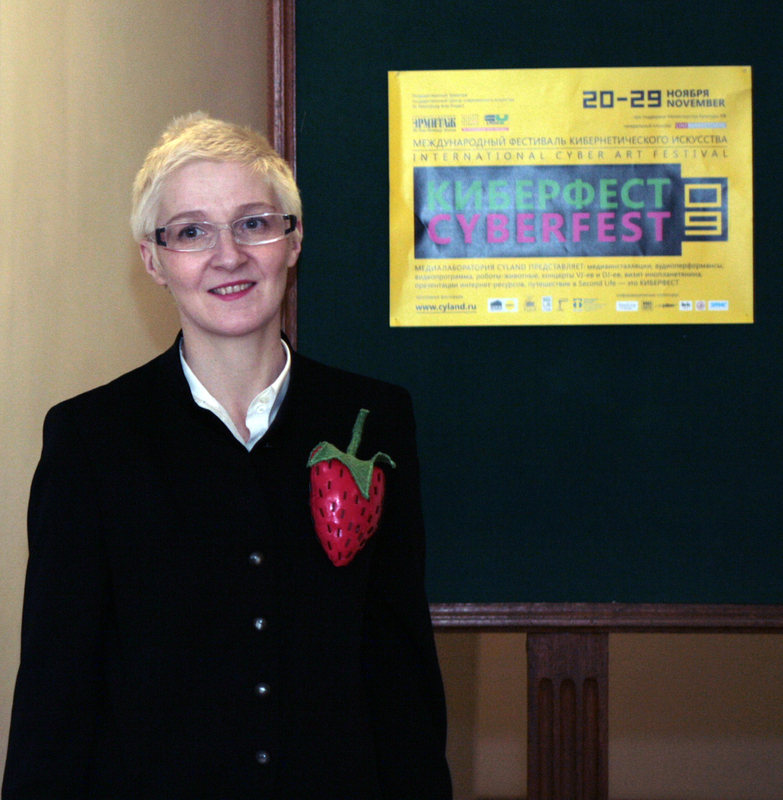 CYBERFEST is created by CYLAND MediaArtLab, organized by National Center for Contemporary Art, St. Petersburg Branch and non-commercial organization Saint Petersburg Arts Project, New York. «Alien space» is presented as a miniature of the human universe: it is amazing, cruel, childish, stupid, beautiful and fragile at the same time. 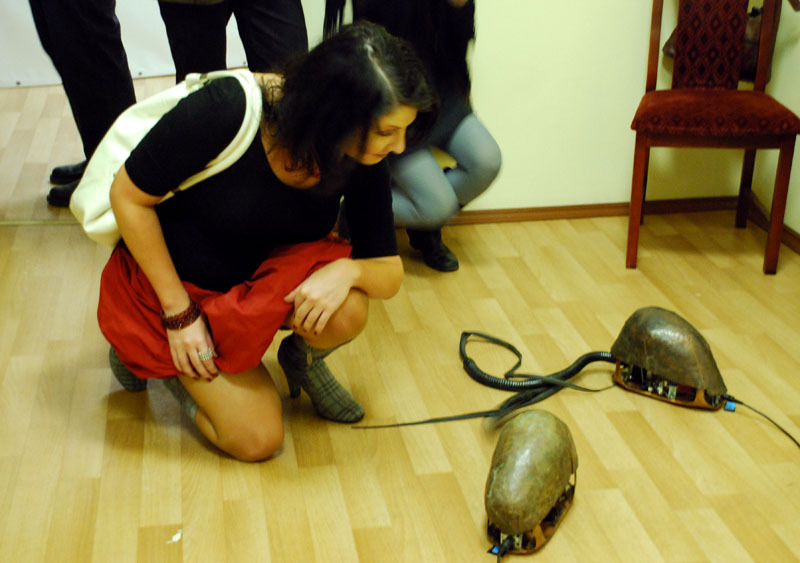 It reacts to all outside stimuli as well as internal changes – every movement by a visitor triggers either sound or image and changes its composition. The installation consists of 800 balloons forming 2 corridors leading to a central circular space. Images of various international television personalities continually mutating into extraterrestrials and robots are projected onto the balloons. The sound environment consists of recordings in 67 languages that mix in a Babylonian cacophony. Throughout his stay in the installation, the visitor is immersed in a constant flux of clear and blurred images and sounds that affect him both physically and emotionally. 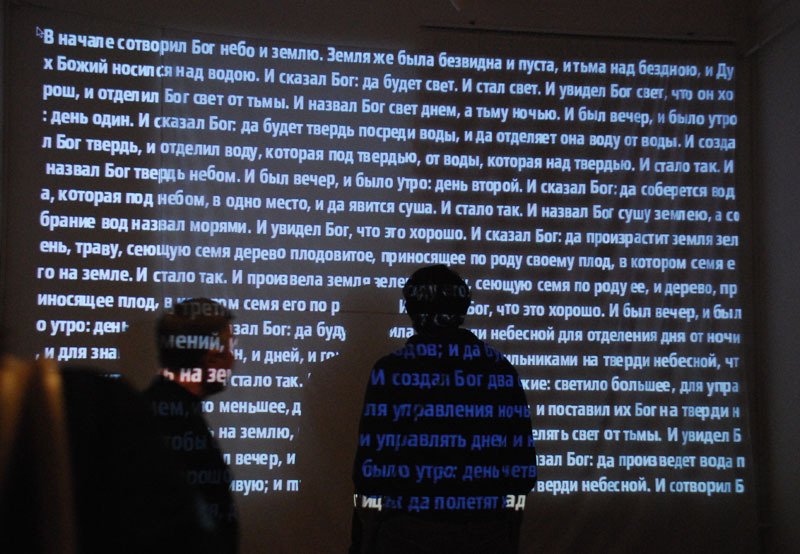 Sergey Teterin "CYBER PUSHKIN 1.0 Beta"
The screen is occupied by 3D- generated “talking head of a cyber poet” that recites, during 6.5 minutes, a series of poems written by the computer program “Cyber Pushkin 1.0 beta” that produces Russian-language poems from the extensive data base (poetry of Yesenin, Mandelstam, Vertinsky and Prigov). Poems are generated automatically, without human participation. The installation uses a phenomenon of “artificial voice” – a donor’s voice is treated by a special program-vocoder. It results in a funny and somewhat intimidating impression of a “resuscitated monster” – a computer creature that competes with a human being creatively and spiritually. The author’s goal is to stir interest in a new creative dialog with the machine and to provoke thoughts about inevitable changes in the contemporary culture (and, in particular, in literature) inspired by the development of computer technologies. Sergey Kotsun, Mikhail Novikov "ORCHESTRION"
The installation is a virtual implementation of the self-playing musical instrument that transforms movements into sounds. Viewers could use their reflections in an electronic mirror as a medium for creation of an original audio statement. «Paralleloid» – panoramic projection – interactive interior – audio-video installation. This work by two contemporary artists could be attributed to such art movement as “Science Art”. The pendulum in the interior’s middle is the source of deviation for parallel lines that are projected on the walls. The project explores the function of the human vestibular system. How does a deviation from the vertical axis impact the perception by the human brain? 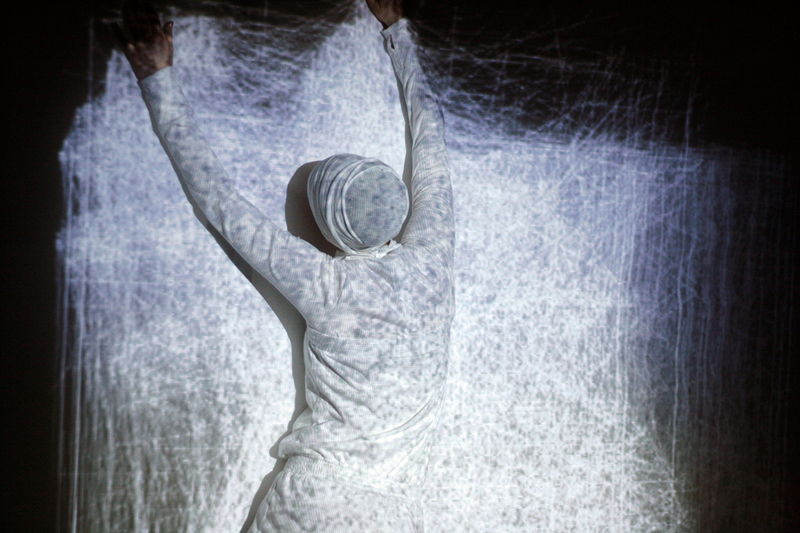 The viewer/participant submerges into the space where the artificial visual and audible environment creates an illusion of deviation from the vertical axis. The artists are interested in behavioral quirks of the human body in an unstable visual environment. 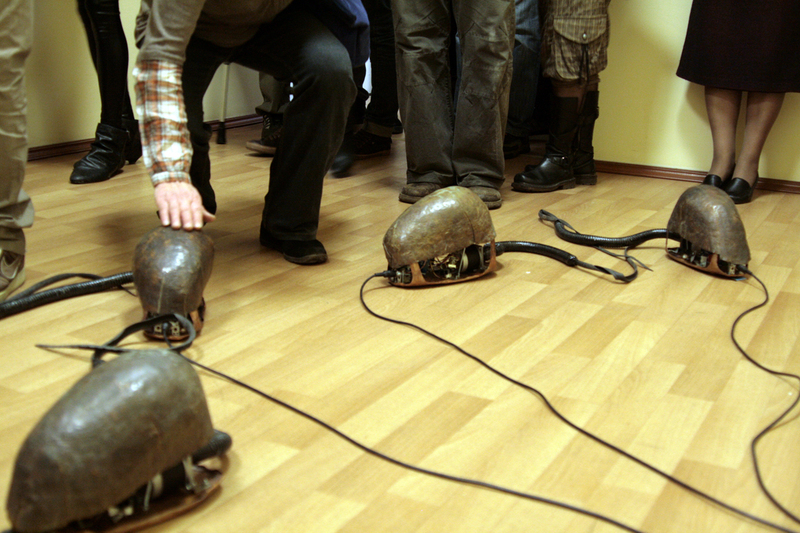 Anton Chumak, Oleg Rodionov, Marina Koldobskaya "Protozoa"
These robots pretend to be neither intelligent not machines. Having sensed an alien presence, they defend themselves in the only manner they are capable of: they are whipping with the flagellum (tale; proboscis; sting). The excitement of one is transmitted to all the rest. In a few seconds, the mass hysteria consumes the entire micro-community. They do not know if it is a friend or a foe that came; can- not evaluate whether their defense is effective or futile; do not distinguish a trifle from a serious threat; they miss the target. They are a bit like you and me. Anna Frants "ACT or a Symphony for Eight Slide Projects"
Old slide projectors create the video sequence of the installation: high-quality images of the new art forms in St. Petersburg. At the same time, they con- tribute to its audio sequence: the rhythmical change of frames “sings along” to the music of Brahms. The entire symphony is directed by a Macintosh computer. The viewer chooses what pictures he likes from the kaleidoscopic plethora of images, thus acting as a co-creator of this world where the old and new technologies sing together in perfect harmony, and the classical music accompanies a very non-classical approach to the legendary city. 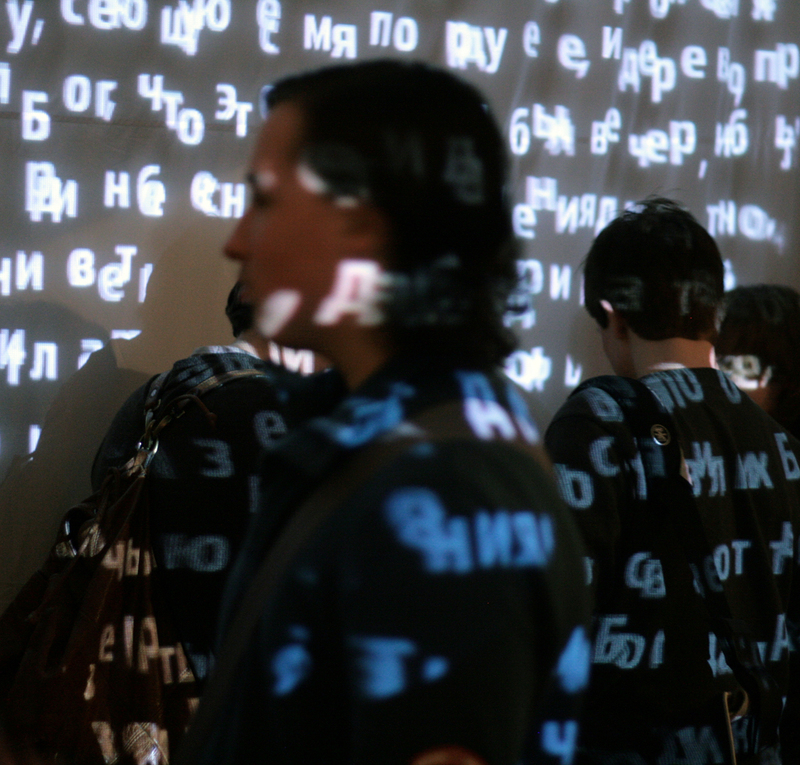 The video installation in which the text is projected on a transparent film (pellicle). The resulting image seemingly floats in space. 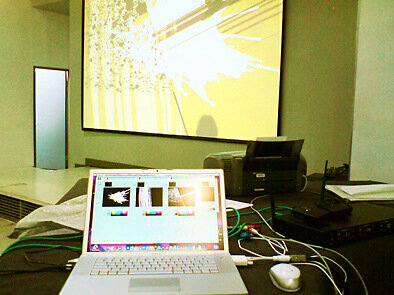 The program, that modulates the text, receives a signal from the video camera positioned in the room. Any movement in the camera’s “eyeshot” arranges the letters, that are darting on the pellicle, into a unified text. Formation of order out of chaos. Creation of image through movement. Active subject of contemplation. Primordial chaos and the word that was in the beginning. In the beginning of any act of contemplation and will, remains the word. Every viewer who emerges behind the pellicle becomes a shadow for those who view it from the outside, hereby disturbing and breaking the word order, unwittingly evolving into a new active element of the installation. This is yet another “conceptual level” of the work. Virgil Wong and Lee Mingwei "Womb of the Pregnant Man"
Like countless other prospective parents, Mingwei Lee wanted to become pregnant. The only problem was that... well, he is a man. Fortunately for Mr. Lee, RYT Hospital-Dwayne Medical Center is a world renowned leader in artificial womb research. As part of our studies, Mr. Lee became the first man to carry a baby to term using an artificial womb implanted into his body. Thanks to his courage, millions of babies born too soon will have a chance to survive. And the definition of motherhood will never be the same. Jiayi Young & Shih-Wen Young "S0UNDW0R1D"
The real-time, interactive sound visualization installation that reveals the intricate mathematical architecture underlying the virtual world of sound. This visualization model is unique in that it uses the physics of sound wave propagation as basis for calculation. 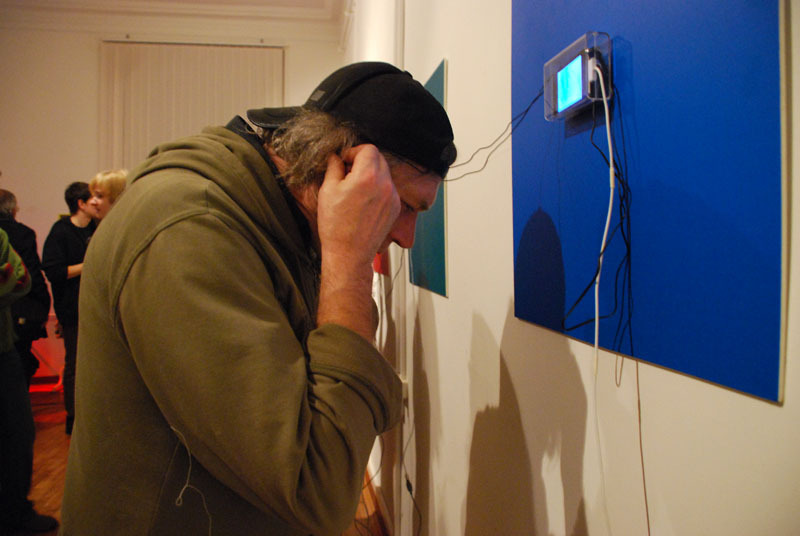 The compositions are a mix of live sound created by viewer entering the space, pre-recorded street noise / cell-phone conversations, and the viewer’s real-time captured heartbeat. The visualization patterns differ greatly from one sample to another. It can sometimes appear random, other times – organized and resembling patterns found in nature, reiterating its connection to the organic world where that sound originated. Artists of the OSOL Art Collective "Share Your Vibe"
Visual fragments used in the installation focus on discovering and analyzing contrasts that currently surround humankind, such as: fear versus happiness, solar energy versus oil, life versus destruction, impression versus identity. Video, music and visuals made by OSOL Art Collective are exploiting the power of contrasts on any levels, since what is so fascinating on one hand is also frightening on the other. 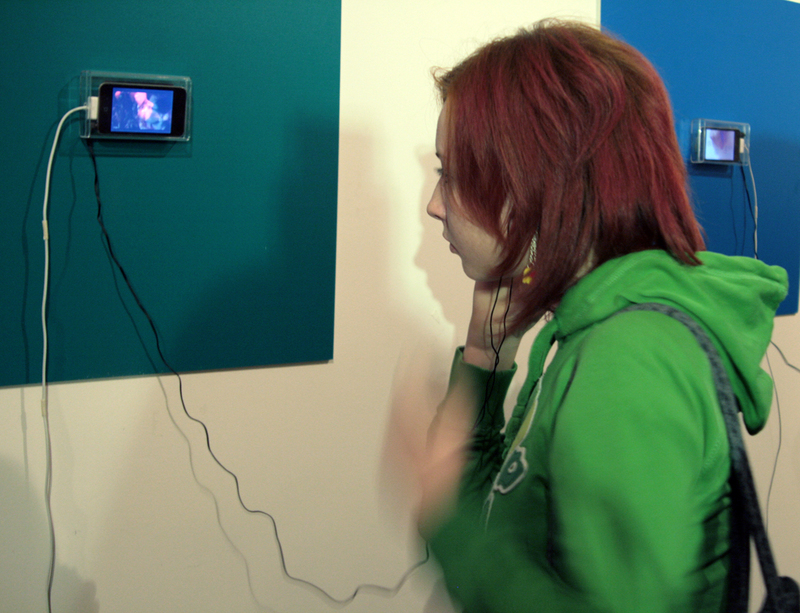 A central piece of this joined exhibi- tion is a “mosaic wall” consisting of approximately five mobile devices such as iPods showcasing video art with music of participating international and invited guest artists. Paul D. Miller aka DJ Spooky "Kino-Glaz/Kino Pravda"
With his remix of “Kino-Glaz / Kino-Pravda” of Dziga Vertov, DJ Spooky wants to engage the 21st century fascination with realism and synthesis from archival resources and make a connection with some of the historical concepts that Vertov pioneered. DJ has rescored and re-mixed the Vertov’s films with a contemporary sound — track based on a combination of contemporary art’s dialectical relationship with video-montage and his work as a composer, artist, and writer. This project is just a first step along the path to understanding how cinema of the 20th century set the tone for the info-aesthetics of the 21st century. Paul D. Miller aka DJ Spooky "Sound Unbound "
Paul D. Miller’s installation and film-rescore of Dziga Vertov and Alexadr Rodchenko’s films and print-designs look at contemporary art in the era of the remix. Sono-Pravda is Paul D. Miller’s conceptual response to Rodchenko’s Constructivist response to the Russian Revolution. Miller’s print/design aesthetic applies some of the concepts of ‘dj culture’ to historic Russian revolutionary imagery and explores its impact on American graphic design in the 21st century. Using the technology of motion tracking, we work with space, body, graphics, light, sound and color. 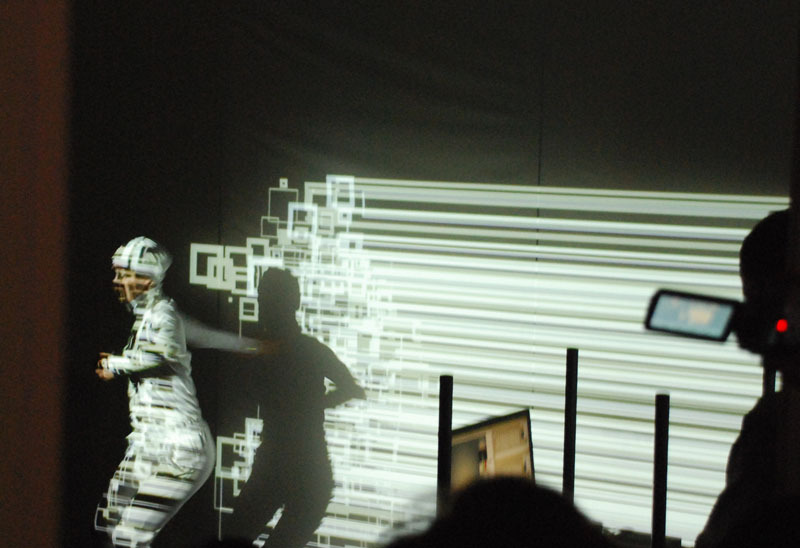 By fixing the performer’s movements, the artist receives the information and, in the real time, transforms the dance into a graphic image; the composer integrates the sound, adding to the visuals. The result is an organic fusion or a relative freedom of the performance elements that form a qualitatively new and integral aesthetic whole. Following a workshop for electronic instrumentalists, the performance will see the conductor as a musician, using the orchestra as an instrument, while each laptop performer shapes the music through virtuoso improvisation and the individual stylization of musical performance. The piece em- ploys the techniques of Hans Tammen’s THIRD EYE ORCHESTRA concept, in which Tammen works with a score that is rearranged every time it is performed, and which is adaptable to any instrumentation. These open-form compositions for large ensembles are based on hundreds of “building blocks” that are constantly rearranged when performed. Carol Parkinson and Hans Tammen "Echolocation"
Parkinson and Tammen will present their work ECHOLOCATION, for live sound processing instruments and Endangered Guitar. 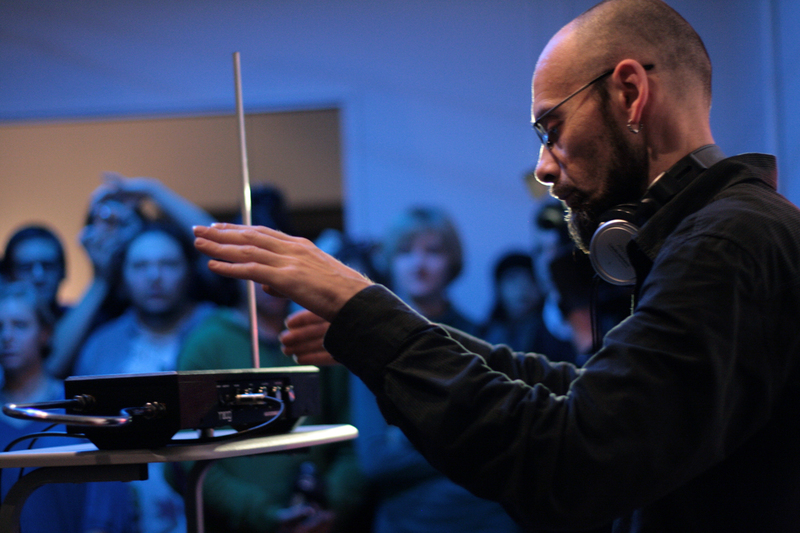 For them, every performance with electronic instruments is site-specific. Their instruments are designed to react with the resonant frequencies of the room, bringing the sonic qualities of the surrounding conditions to the listener’s attention. They start with some microscopic sound details that investigate the acoustics of the room. Small but controlled variations are introduced persistently, some take on a new musical life on their own, others die out at a very early stage of their existence. The random drift moves the piece slowly into new directions following the characteristics of the room. The multifaceted artist and experimentalist Andrey Bartenev, for whom art is “a single current” offers his performance that represents the neorhythmic structuring of a darkened space and the demonstration of green spots in the slow-motion transformation of volumes. 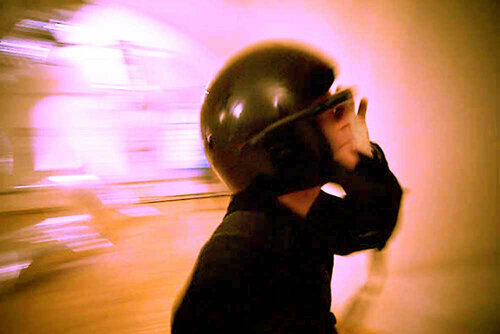 The spectators move inside the exhibition room wearing a helmet with wireless video goggles. Movement sensors are built in the helmet. The sensors and goggles are connected with a computer through radio signal. The sensors register the spectator’s walking speed and transmit their signals to the computer which transforms the signals into psychedelic visual images. The faster the spectator moves (walks, turns around, dances), the more intense the psychedelic TRIP is. 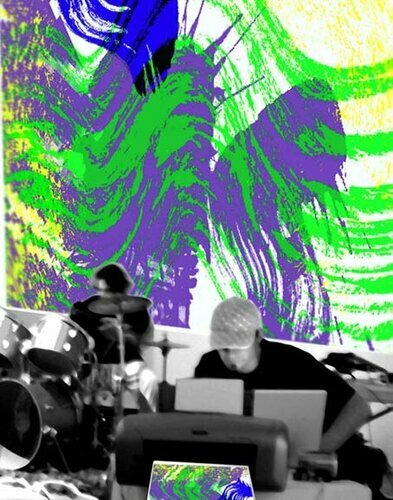 In this interactive media performance, music transforms into paintings and viewer becomes directly involved in process. Computer, running Drumpainting program, registers surrounding sounds and turns them into images – from abstract spots and lines to photos and video films, loaded into database. 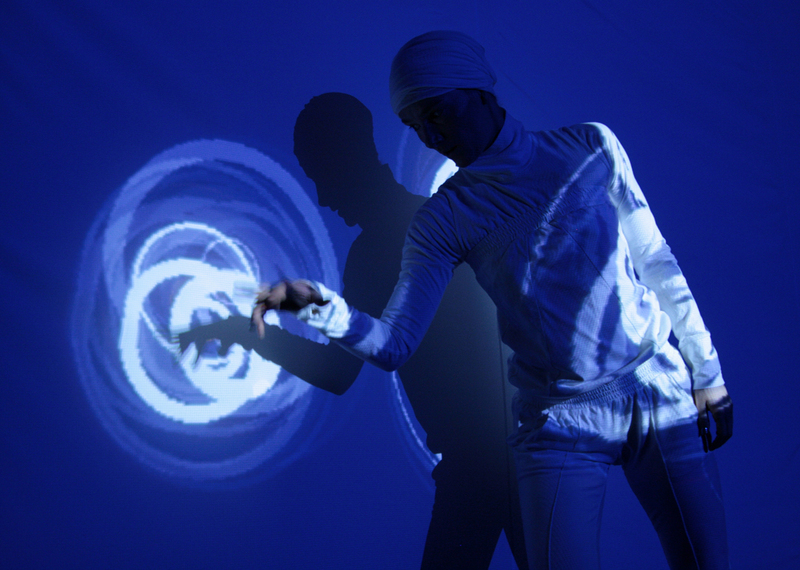 During the performance, a human drummer is playing, and rhythms transform into elements of abstract graphics. Merging and overlaying each other, graphical elements create paintings, which instantly change with music. Program interface allows redefining colour and shape of elements and every viewer can do this. Though “picture of music” is changing constantly, one can print and take the image he likes. Dmitry Shubin "Phono Tactics: Exercises for the Theremin"
Phono Tactics is a linguistic term. The Phono tactics deals with the study of the groups of letters are allowable in a syllable or a word and the ones that are impossible by definition. Each place has a certain background sound whose characteristics, in fact, allow to identify the space, one way or another. 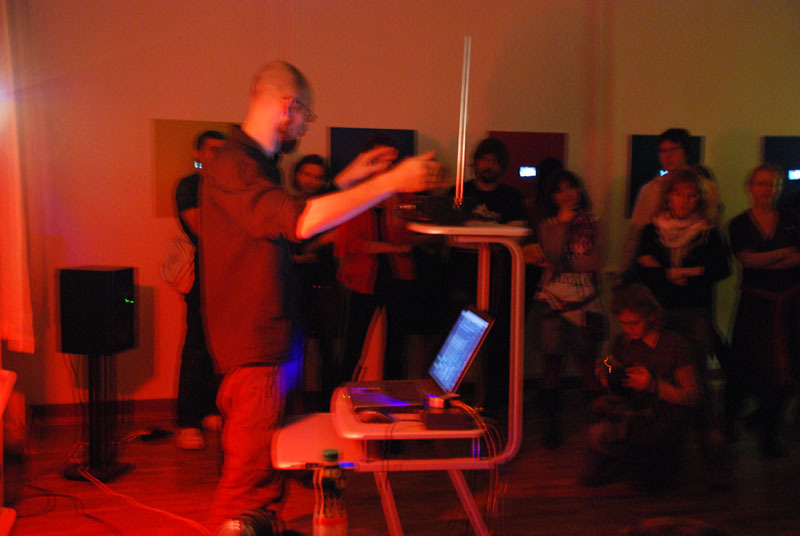 Violations of these “rules of euphony” in the semantic, harmonic and tonal respects are what constitutes the object of the “exercises” in the phono tactics that are achieved through the Theremin and notebook computer. Perpetual Art Machine [PAM] is a living archive of 21st century international video art featuring over 2000 videos and over 1000 artists from over 60 countries. [PAM] is one of the largest international community video-art portals on the Internet today. [PAM] leverages the full potential of convergent media, advanced computing technologies not only to stream video artist’s work on- line, but also to exhibit video in large-scale interactive installations. Created in 2005 as a collaboration between the artists Lee Wells, Raphaele Shirley, Chris Borkowski and Aaron Miller, [PAM] democratizes the curatorial process for both the artists and for the viewer/user through an open submission policy, social tagging and touchscreen/keyword access during display. 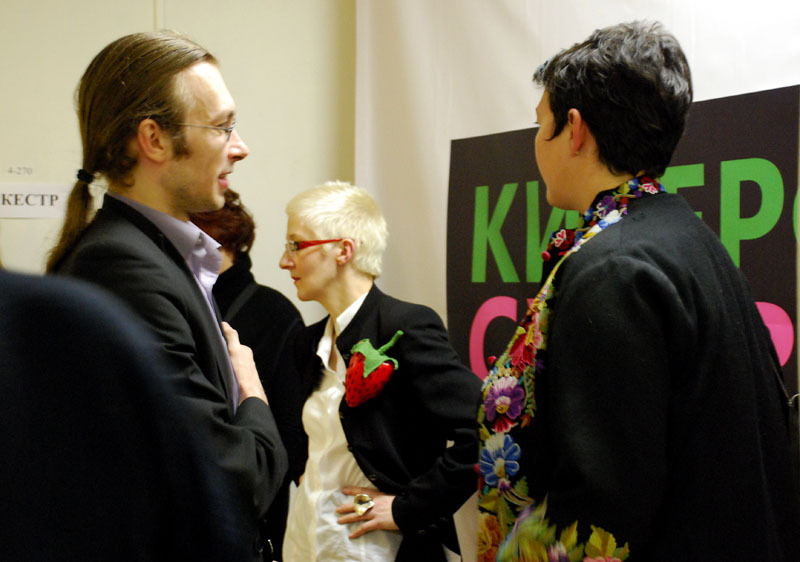 This internet-seminar is hosted by the Viennese artist and designer of virtual worlds Pinkpink Sorbet who will present to the public the virtual space CYLAND in the Second Life and answer the questions, such as: How to conduct art events and exhibits in the Second Life? What could be accomplished by joint efforts in the virtual building of CYLAND in the SL? What benefits and advantages do artists receive in the SL? Technocalyps is a three-part documentary about “transhumanism”, a worldview assuming that we approach an era where human kind, as we know it, is no longer the driving force of civilization. All technological developments seem to converge to one main goal: to overcome our human limitations, to try and create higher, transhuman forms of life. The documentary will launch the societal dialogue on science and technology, on mankind and nature, on mankind and culture... for the upcoming decades. Anastasia Maksimova, Aleksandr Ovsyannikov "Prometheus"
The legendary Prometheus Research Institute will present its “color-music films” created back in the Soviet era. Alexander Ovsyannikov will lecture on the “Kazan pages” in the life of Lev Termen who invented the first electro-musical instrument “theremin”. Viewers will also be introduced to one of the earliest examples of the Soviet applied color-music instrument “Disco” (1985). This is one of the first films about the theremin filmed in the company of Bob Moog (the actual footage was made back in 1970s). The documentary contains many thoughts on the nature of the mysterious Russian electro-musical instrument – from the American point of view. Up front is Clara Rockmore, Theremin Prima. The presentation of the translation will be accompanied by the theremin story and the viewing of fragments from the film. Photoshop and other online applications made the collage (and its time-based cousin, the mash-up) a regular activity for the average computer user, but that has not led artists to abandon these modernist techniques. “Mass Cut” describes an attempt to develop a new vocabulary for salient features of collage and mash-ups produced and distributed using networked computers. This project considers a variety of examples, including works by artists like Michael Bell-Smith, Petra Cortright, and Jacob Ciocci, the group blogs Nasty Nets and Double Happiness, and widely used online services such as ytmnd.com, Polyvore, and Tumblr.